Pure bliss, in the making. But isn’t there ample evidence supporting the health benefits of coffee? Studies show that caffeine boosts performance, improves circulation, reduces the (perceived) muscle pain, and enhances memory for up to 24hrs after it’s been consumed. I mean, wow. Quite a feat for a substance they sell legally at every corner shop. Researchers point out one thing though: Be regular in your intake to allow your body to adjust. 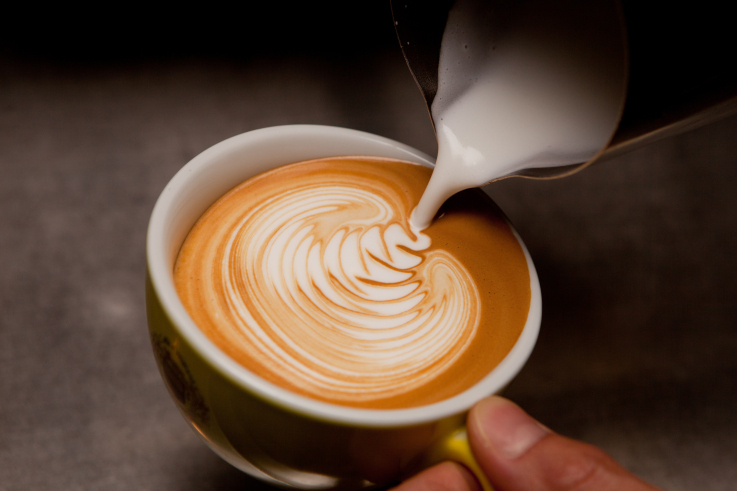 For most of us with our busy lifestyles there is only one solution: Take away coffee. And see, this is where I have another massive issue with coffee. No, it’s not the coffee. It’s the take away cups. Ever wandered past a coffee shop in the evening, on your way back home from work? These shops almost block the sidewalk with their huge plastic bags of discarded cups. And these are just the ones used in-store, not even the ones that were actually ‘taken away’. I mean, they put these bags out every day? But then, who has time to sit down and enjoy their coffee, every single time the caffeine craving kicks in? The dark side of take away coffee. 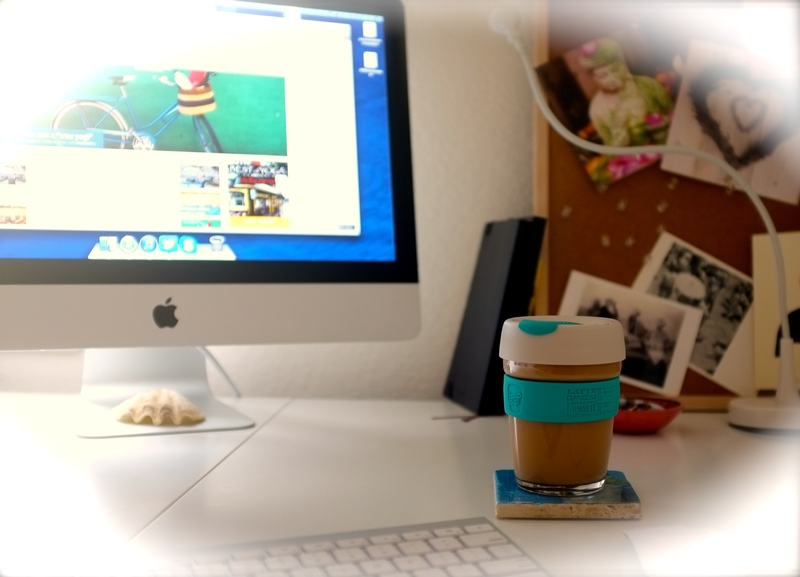 When I moved to Melbourne two years ago I came across a solution that’s so obvious and straight forward, it’s one of the things that makes you wonder ‘why has no one thought of this before?‘: The Keep Cup. It’s as easy as the name suggests: You bring your own cup, and you keep it – means, you reuse it. Every single time. For me, that’s saved about 3 take away cups a day, Monday to Friday, so that’s 15 each week, and a stunning total of 795 take away cups each year! When I travelled back to England about a year ago I was pleased to find them on the shelves of my local Whole Foods – apparently it’s a concept that keeps gaining traction, and it all started in a Melbourne café back in 2008 with the desire to reduce waste. 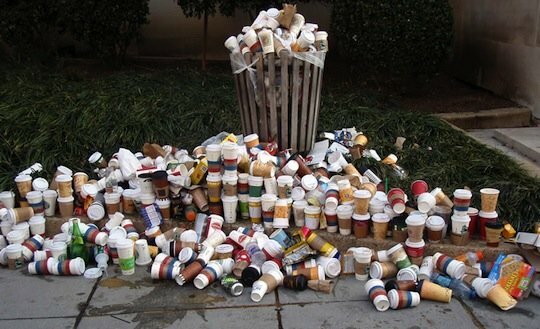 Take this in: Globally, every minute one million disposable cups are discarded to landfill. One million? And there are still coffee shops that won’t even ask you ‘have here, or take away?’ because it’s easier to throw out plastic cups than to bother cleaning ceramic ones. They say “you’ll have fun trying” breaking this cup – and yes, the glass feels incredibly thick and solid! I’ve been using my plastic Keep Cup for about two years now and was pleased to see that there’s a new glass range. Because the most surprising thing about how I use the cup is that I also use it on weekends, at home. Since I listen to my Ayurvedic doctor and add heaps of milk, the coffee tends to get a film as I’m a slow drinker – but not with a closed lid! I know I’m only reducing the one million cups a minute by a tiny fraction, but then, isn’t that already a good start? You can get (and design) your Keep Cup here, there’s a myriad of colours and 5 sizes (from espresso to mug sized) available; companies can even offer Keep Cups to employees with the company’s logo on the banderole. If you need more to be convinced, there’s a Fact Sheet here (did you know there’s enough plastic in 20 disposable cups to make one Keep Cup?) and you can calculate your impact here. How do you have your take away coffee? Do you have a re-usable cup? I’d love to hear your thoughts! Credits: First image / Second image. Finally – this is the perfect Chai! Coffee itself has many benefits. Coffee is a drug and is just like garlic which is a source of healing when needed. Coffee stimulates the sympathetic nervous system which activates a cascade of stress hormones that in certain situations can be useful. The problem is daily consumption of a stimulant coupled with an already taxed our nervous system from everyday life stressors and you now have a recipe for disaster and coffee/caffeine is adding gasoline to the fire. Coffee does not promote healing in a stressed out environment. It is good for occasional use. Think of an aspirin. You wouldn’t take an aspirin every single day would you? Not if you dont have any pain and even then, you are using it to cover up an underlying issue. Coffee is a healing tonic,not an every day tonic. To justify it is just your ego brain telling you it’s ok. It is not. Ummmmm, buying coffee from chains using pesticide-laden beans and devitalized pasteurized and homogenized milk from, most likely, mistreated cows is as big an ayurvedic no-no as overconsumption of coffee itself or trashing the environment. I’m hight pitta and right now I’m drinking coffee black because I’m in the mountains of costa rica and it’s cool and wet here (Kapha environment, opposite qualities to what coffee [dry, hot, and bitter]). At home in Denver I only have small portions of coffee when I’m experiencing kapha symptoms induced by, for example, overindulgence in starchy or suggary foods. This is the way ayurveda works, though opposition therapy and your current environmental, internal, and constitutional make-up. It’ not just about your dosha. Thank you for your comment – you are absolutely right, there are more issues around coffee chains than just the plastic cups. I’d like to see the milk they’re using and if in doubt I’ll go for rice or soy milk (not the perfect solution either – the best would be to find a cafe that is transparent about where the products come from). It’s very interesting what you say about how what you need does not only depend on your constitution but also on the environment you’re in. When I had my ayurvedic consultation back in London they clearly said that all this needs to be reassessed after my move to Australia (given the difference in climate and native food). So true and so necessary. If I go out and forget my cup, I won’t get a coffee or tea, simple as that. They should implement the rule that you have to have your own cup, like a lot of grocery stores that have stopped using plastic bags. Good post! Great post! I will have to look into that cup (I’m in LA) but in the meantime love the ones I usually bring with me! I don’t understand why none of the coffee shops even offer recycling bins! They’re giving recyclable cups day in and day out, yet don’t provide an area to put them for conservation purposes–it makes no sense! It should be mandatory. Thanks again for the great article and insight! Keep Cup US are based in LA, so getting your hands on a cup shouldn’t be a problem! I recently also bought the limited edition with the cork banderole, highly recommendable! I quit plastic water bottles, its time to quit non-reusable coffee cups! When I spent a semester in England 10 years ago, people always gave me strange looks when I brought my plastic bags back to the supermarkets to re-use them. They did not understand why I would bother! I totally get you – I like taking my time. I sometimes work and “forget” my coffee, which is why I now use the cup at home – the coffee literally keeps warm forever! I am so with you on this one 🙂 I only have one maybe two cups of coffee a day, but the pleasure I get from that coffee never seems to diminish…and my understanding ayurvedically is that coffee is useful for kapha types (ahem. like me) 🙂 Not that I am an expert. I love the look of those cups – I live in a rural area and mostly make my own coffee, but I do get takeaway coffee once or twice a week which is bad enough. ok so if you go to a local coffee shop, you give them this cup to put your drink in? I wonder how that would work here in the US. This is the first I’ve heard of this particular cup. Keep Cup US is located in Los Angeles, so you can get them there too. Not sure about actual stores but it’s possible to order online. Who knows, maybe they’ll be really en vogue there soon!